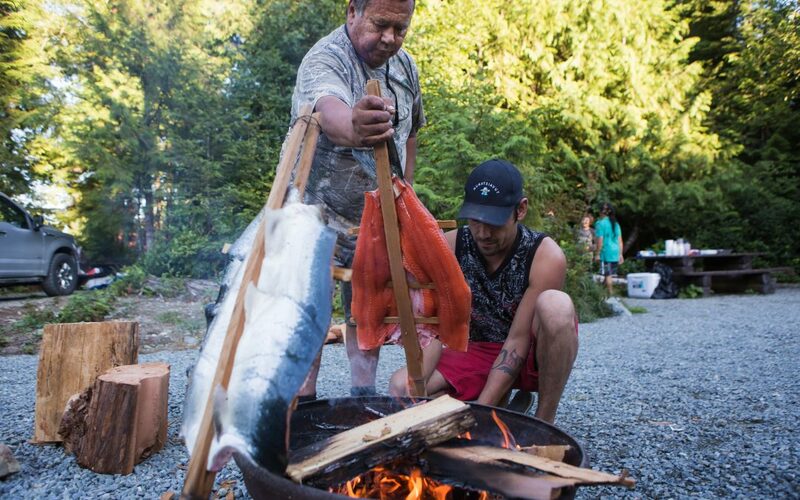 Ocean foods have nourished and sustained Nuu-chah-nulth First Nations for millennia, yet today many challenges exist for those who want to access Nuu-chah-nulth foods and exercise their Aboriginal rights to those foods. The traditional foods that our ancestors enjoyed remain a significant aspect of social and cultural events, yet often it is only Elders who understand how to harvest, prepare, and preserve these foods. Having the knowledge and skills to access good, healthy foods for ourselves and our families is an inherent right that should be encouraged at the community level. This was part of the motivation behind three harvesting workshops this past summer that Uu-a-thluk organized and coordinated in the three regions (i.e., Southern Region: China Creek and Broken Group Islands, Central Region: Toquaht Bay, and Northern Region: Nootka Sound and Yuquot). Thanks to a Special Projects grant from the Nuu-chah-nulth Employment and Training Program (NETP), Uu-a-thluk was able to launch this pilot project to better equip Nuu-chah-nulth for aquatic-related employment opportunities. Community members in this summer’s harvesting workshops learned a range of skills and knowledge such as the Nuu-chah-nulth connection to ocean resources; modern ways of harvesting salmon, crab, prawn, groundfish, and kelp; how knowledge of harvesting ocean resources ties into careers in the fisheries and eco-tourism industries; handling, cleaning, filleting salmon, how to prepare kuutchis salmon (Nuu-chah-nulth salmon barbeque over fire), and preservation methods such as canning. Participants in the Northern Region workshop canned bull kelp and made bull kelp salsa, while in the Central Region community members learned about the importance of the potlatch for Nuu-chah-nulth governance and for important events such as naming and coming of age. This past summer while the workshop was taking place, Toquaht community members were in the throes of harvesting for a special memorial honouring Bert Mack (Deets-kee-sup), who served as Ha’wiih (Hereditary Chief) of Toquaht First Nation until 2009. Those taking part in this workshop also learned about how Nuu-chah-nulth would move through the seasons harvesting food during the 13 moons of the Nuu-chah-nulth calendar. Anii-tsa-chist , Toquaht fisher and President of the Nuu-chah-nulth Seafood Development Corporation spoke about the importance of the “Seasonal Round” or Nuu-chah-nulth calendar based around our foods and 13 moons. “To truly get back to traditional foods it’s important to know why and when different foods are harvested,” he said. “We’ve been removed from the fishing industry and the coastal way of life,” adding that the residential schools and the shutting out of Nuu-chah-nulth from the commercial fishing industry have massively contributed to this disconnection. The training offered in the workshops enhances the capacity of Nuu-chah-nulth First Nations Fisheries Department staff to support outreach activities. Field-based training opportunities such as this that connect food sovereignty and food security with employment on the water are crucial to ensuring the long-term success of fisheries. Defined by the principles of his?uk?is? c?awaak meaning “everything is connected,” as Nuu-chah-nulth we understand our sacred duty to foster healthy relationships with the land, waters, plants and animals that give us our food. With this comes the necessity to respond to our own requirements for safe, healthy cultural foods and the ability to make decisions over how much and what food we hunt, fish, gather, grow and eat to feed our communities. Engaging youth in the continuation is vital and often begins with something as simple as a first fishing lesson. Anii-tsa-chist recalled the thrill of catching salmon on a rod was the first time. “Adrenalin takes over and that excitement takes me right back to being a little boy and fishing stickleback in the rivers,” he said, adding that somewhere along the line he learned from his grandfather and father about cleaning the fish and respecting it at the same time, that this ethic was instilled early on.